Bodegas La Val was founded in 1985 and is one of the pioneering brands of the denomination of origin Rías Baixas. The winery is located in the municipality of Salvatierra de Miño,on the banks of the River Miño,in the country estate called La Val which is in the parish of Arantei. The winery of La Val cultivates on its vineyards the varieties of Albariño, Loureiro and Treixadura. This modern and well equipped winery produces quality,artisan wines using traditional and natural wine techniques under the Denomination of Origin, Rías Baixas. La Val has three wine estates : Arantei , Taboexa and Pesegueiro with a total of 50 hectares of vineyards and is therefore one of the most important winerys in Galicia for its own production with a capacity of over half a million litres. 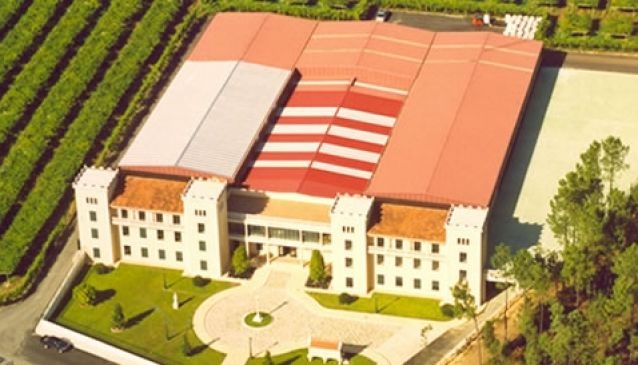 The building which houses winery is situated in a vineyard of 35 hectares and the winery's facilities include a hall,offices,event rooms ,laboratory, kitchens wine tasting rooms etc. Wines include: La Val - Albariño,La Val Crianza sobre lías,La Val Fermentado en Barrica - Albariño, Finca de Arantei - Albariño,Orballo - Albariño,Viña Ludy - Rosal and liqueurs (white,herbal and coffee). Bodegas La Val have a strong and established presence in Spain and strong export market and you can find their wines in the USA,Brazil, Mexico, Great Britain, Sweden, Switzzerland, Denmark, Germany, the Netherlands,Japan and China!. Recent awards include a Silver Medal at the International Wine Challenge in England. The bodega also provides catering for events held at La Val.